What is the Travel Photography Guru Site? Welcome to the official website and blog for Glenn Guy the Travel Photography Guru. Based in Melbourne, Australia this is an educational site for those souls with a passion for photography and a desire to both explore and share the beauty of our natural world and its people. 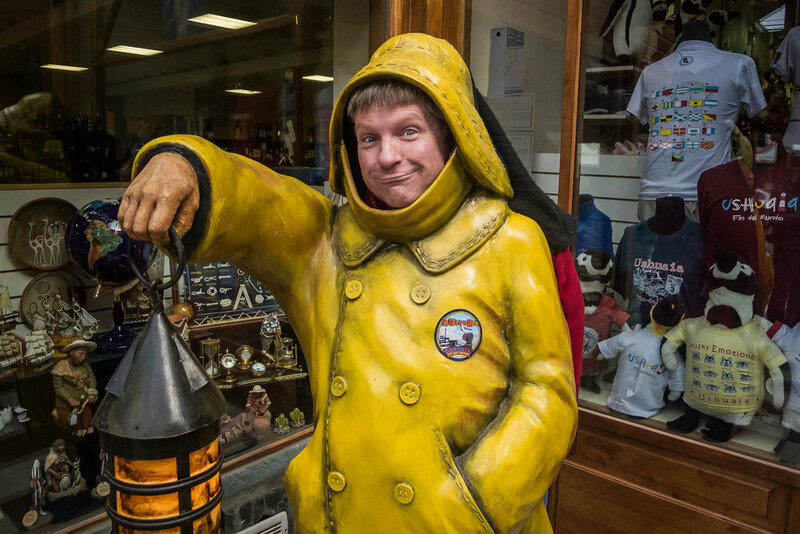 A self portrait of Glenn Guy, the Travel Photography Guru, in the village of Nordragota in the Faroe Islands. 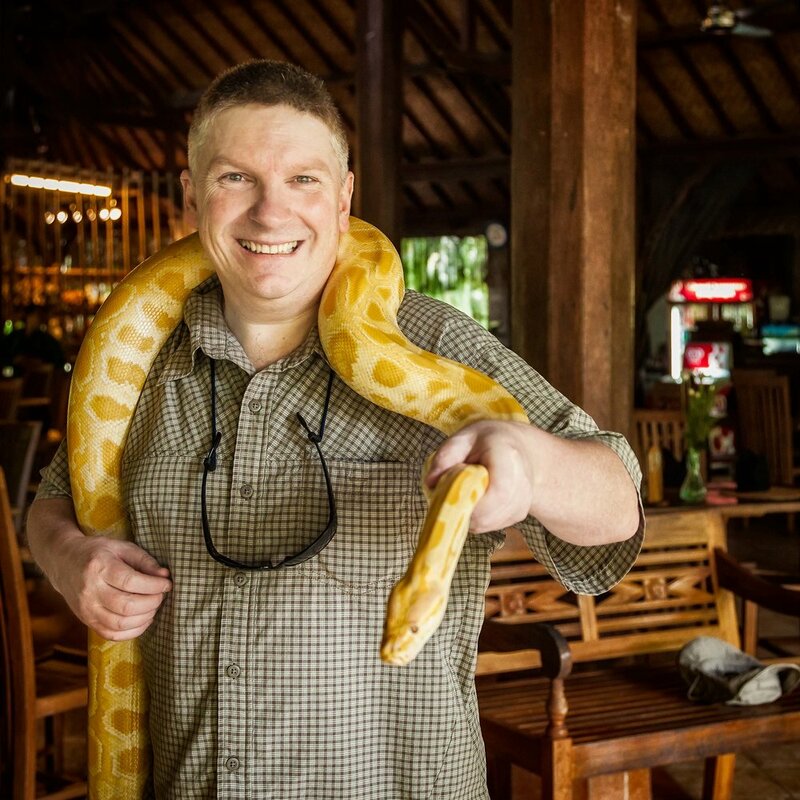 Glenn Guy, photographer and owner of the Travel Photography Guru website and blog, holding a python at a zoo in Bali, Indonesia. I've enjoyed working as a stills photographer for film and TV including Fish Out Of Water, a documentary on the environment for Foxtel staring former Olympian and World Champion swimmer Ian Thorpe, and the Australian motion picture film Summer Coda. Over the years I've completed a range of commercial assignments for clients including Kodak (Australasia) Pty. Ltd., National Australia Bank and Australia Post. You'll enjoy viewing my special photography collections. However, nothing beats the experience of gazing at a large, framed print on a wall in your home or office. I produce a range of portfolio standard prints which are collected at both a private and corporate level. For further information on purchasing prints directly from this site feel free to Contact Glenn directly. A photo of Glenn Guy, the Travel Photography Guru, on top of a hill above Paradise Harbour in Antarctica. A range of eBooks and online photography courses will soon be available from this site. They have been a labor of love and something I'm really excited about. This photo, made on my mum's nature strip during Christmas 2008, includes the members of the extended family who made it back to mum's for the celebrations. Sadly, as the photographer, I'm usually on the other side of the lens. My mother Mary Guy remains the great love of my life. Have you ever heard the line, "Work hard and be good to your mother." Perhaps it's some of the best advice a young man or woman may ever be given. And to be true to that advice is of critical importance. While we can always do more, we need to be content in the knowledge that we've done, and continue to do, enough. During my late teens and early twenties I played in a number of rock, pop and surf bands. The first of those bands, Taxi, has always been the most important. My old school friend, who I've known since grade prep, Tony 'Bert' Lambert and I joined singer/guitarist/songwriter Rod Knights and drummer Darryl Smith and, with the inclusion of lead guitarist Russell Bateman, began our two-year stint together. The other band that I remember most fondly is the instrumental surf band The Swingin' Hi-Tones. I joined the band quite late, yet am so happy to have been involved in the recording of their seminal album The Fabulous Surfing Sound of The Swingin' Hi-Tones. The boys and I have reunited over recent years for a few gigs and to record a new vinyl EP released in 2014. I've created a new website to revive old Hi-Tones memories, together with other bands from the Thong n' Dance label, and bring the band's sound to a new audience. Just when I thought my days playing guitar were long gone I was invited to join a Melbourne based band Murder Of Crows. Our song list included rock, pop, blues, gospel and country. We played in Melbourne and around the state and it was a lot of fun. However, while it's possible to be good at a lot of things, it's almost impossible to be a master of more than one. I left Murder Of Crows in December 2016 to concentrate on building the Travel Photography Guru online brand. I have no regrets as it was absolutely the right decision for me. Glenn Guy, Travel Photography Guru, lighting the way as co-tutor on a photography tour to the Falkland Islands, South Georgia Island and Antarctica. Over the years I've worked hard to develop a straightforward and easy to understand teaching style. As a result I've established myself as a popular and effective tutor. My desire to share my knowledge and experience, with an ever-wider audience, has resulted in a range of educational products, soon to be available through this site. A variety of private and small group classes can be organized by Contacting Glenn directly. Practically based workshops and speciality photography tours are announced, on this site, at regular intervals. I'd love you to join our growing community of like-minded folk eagerly exploring their passion for photography. We achieve our goals by interacting with a wide range of people and immersing ourselves into cultures and landscapes throughout our most beautiful world. Please feel free to follow me via one or more of the social media links listed on the side of this page. There's so much inspirational content for you on this site. My blog is usually updated five times a week and a photography podcast will be released during July 2018. I'd recommend that you bookmark my blog and podcast and return to this site on an ongoing basis.